What is a rescore, and what does rescoring a group do for my participants? Admins have the ability to rescore a current active challenge group in the admin center. If a challenge group is closed, or pending it cannot be rescored. What does a rescore do? If a user does not sync steps to MoveSpring for more than four days when they next open the app, our system will attempt to retrieve that past data. Totals will sync to the user's account, but those past days may not be scored in the challenge group. Rescoring the challenge group will ensure that all totals in a user's MoveSpring account are registered in the challenge stats. Rescoring will do this for all users in the challenge group. Please note: Rescoring a challenge group will not fetch data for a day showing 0's in a user's MoveSpring account. Totals need to be present in the user's MoveSpring account to be rescored. Prior to rescoring a challenge group we suggest that you send out a sync reminder to your users, via the content module or chat feature. The best time to rescore a challenge group is the grace period and at the end of the day. Once the three day grace period is over the group will close and you cannot rescore, all data is final. 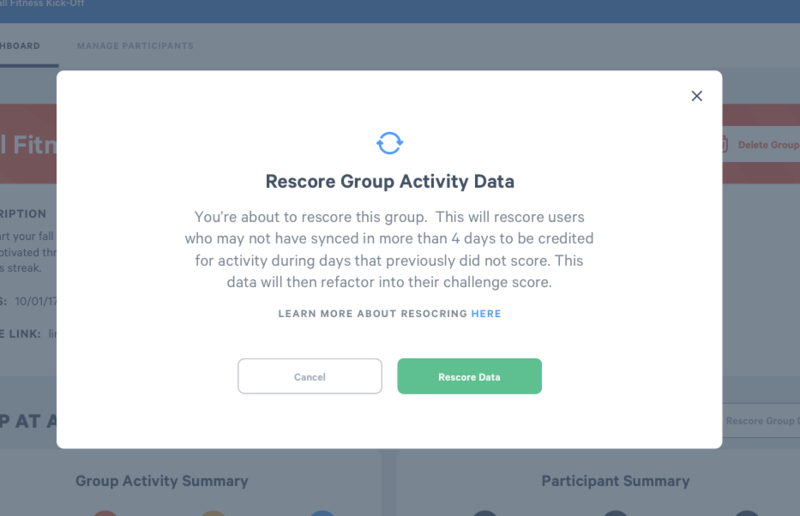 Rescoring a challenge group at night allows users additional time to sync and get credit for their activity. Please do not rescore a group each day. For longer challenge groups we suggest once a month. For groups running for less than a month we suggest once a week. Be mindful that this can take some time to complete. The longer the duration of the group and the greater the number of users participating, the longer the rescore will take to fully process. You may have already seen the rescore button on each of your group’s pages. To rescore a group, click into a group from the Groups tab. Just above your Participant Summary section, click the grey button the reads “Rescore”. Read the information in the box, and select “Rescore Data” to initiate. A rescore may take several minutes. Please reach out to our support team if you have any questions about rescoring a challenge group.